... in all the right places. 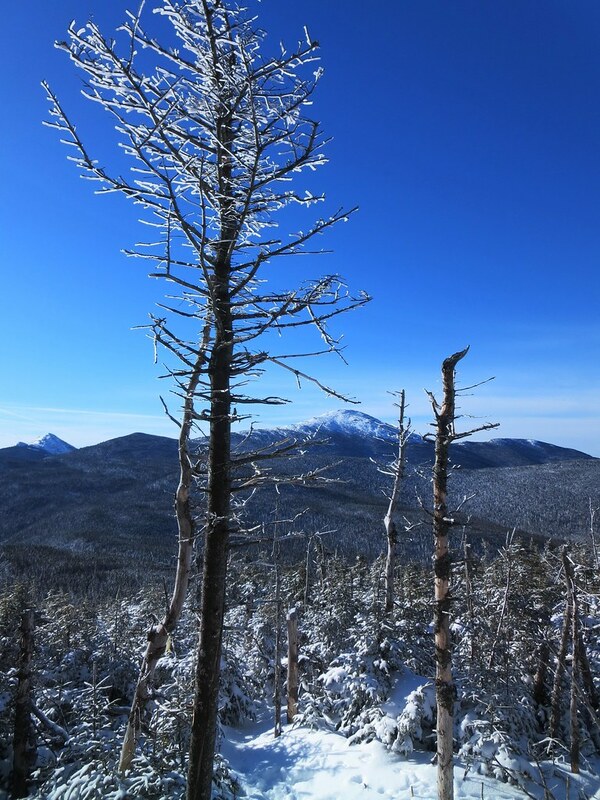 I spent a beautiful Saturday morning hiking to Tabletop and Phelps from ADK Loj. A shout-out to the forum members I met "Hi KV_Streamer, DLhiker, and gb-mtns!" I had to leave home extra early to make it happen but it was worth it. My wife needed the car back by 4:00 PM so after scanning March's Grid list, I chose Tabletop and Phelps for the day's peaks. I budgeted 12 hours for the outing based on 5 hours for driving, 6 hours for hiking, plus a 1 hour margin for error. I'd need to leave at 4:00 AM so that meant getting out of the sack at 3:30 AM. On Friday evening, to save time the following morning, I packed the car with gear and set out everything I'd need to prepare breakfast. My standard winter-hiking brekkie consists of banana, cereal with skim milk, two poached eggs, three slices of buttered toast, and a mug of tea. My short-order cook skills are improving and I managed to wash, dress, cook, eat, check weather and news, tidy the kitchen, brush teeth, and kiss my wife goodbye in 35 minutes. Five minutes behind schedule but the margin would absorb it. The pre-dawn sky was decorated a new moon, a ghostly fingernail low in the eastern sky. Nautical twilight arrived around 5:20 AM and backlit the Green Mountains with an indigo glow. I arrived at the ADK Loj shortly before sunrise and saw several hikers heading for the trail-register. A sure sign of a busy day to come. I crawled over the console into the passenger seat and began preparing for the hike. I signed in at 6:37 AM. The sky was clear blue and it was a brisk -17 C / 1 F. The trail was frozen ground skimmed with ice. My Trail Crampons immediately began playing "Ode to a Rock Crusher". Right on cue, I began to sweat and, copying last week's success, I stripped down to a single baselayer. It was still nippy and my arms and belly felt on fire. Nevertheless, it successfully reduced the sweating. I marveled at the hikers I passed who wore insulated jackets and pants. I opted for the 'squirrel' crossing and it was in fine shape; Marcy Brook was frozen over. I emerged on the Truck Road and paused at the dam to check my watch. My Loj-to-Dam time is a measure of my pace and health. Forty minutes is average and I just did 37 so all systems were nominal. Onwards and upwards! The paucity of snow is quite remarkable. There's only about an inch covering the woods flanking the Van Hoevenberg trail. It doesn't increase appreciably until one passes the junction to Phelps Mountain. In contrast, it feels like true winter at Indian Falls. Marcy Brook is invisible under the snow. Beyond Indian Falls, the trail definitely looks skier-friendly. I paused to view the MacIntyre range and then backtracked to the Tabletop junction. Colden and the Macs from Indian Falls. It was the first time I followed the re-routed section. They've done a fine job of putting distance between itself and the ski trail. About 200 yards from the junction, I stashed my snowshoes under a snowy spruce bough. It was near a bend in the trail and I scribbled a few lines in the snow to mark the spot. The trail to Tabletop was in tip-top shape. Normally it's a muddy gutter but on Saturday it was a smooth highway of snow and ice. I passed the new summit sign and proceeded to the eastern lookout where I was greeted by Basin, Haystack and Marcy. Seeing all there was to see, I made a speedy descent and had so much fun that I passed my hidden snowshoes. Everything about the topography indicated I had missed the cache; the land had leveled out and the tree boughs were no longer at ground level. I dumped my pack and walked back about 100 yards to retrieve my snowshoes. 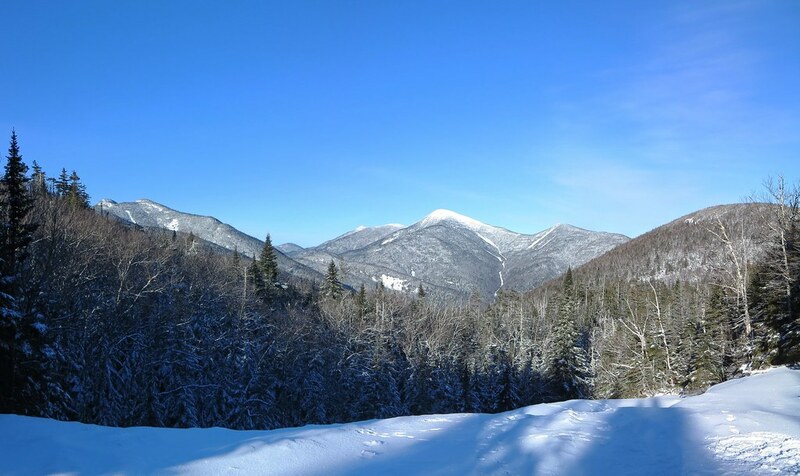 March 5th happened to be the day of the ADKHighpeaks Winter Gathering. 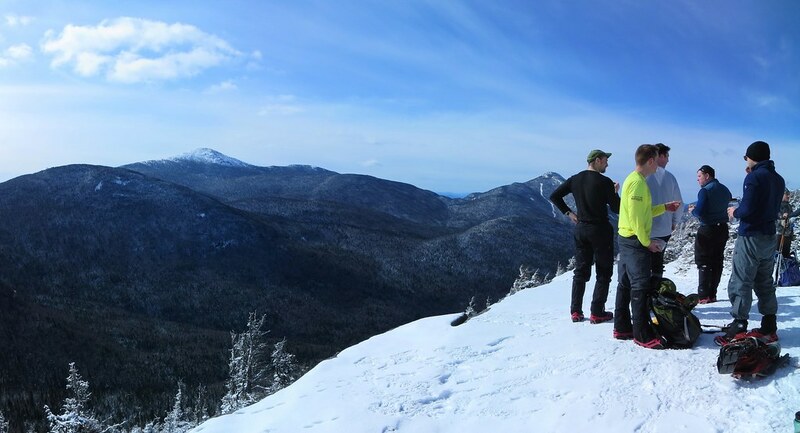 An annual event involving fund-raising, hiking, eating, drinking, and socializing, it also attempts to place at least one person on each of the forty-six ADK46er summits. I knew who had registered to climb Tabletop and Phelps so I asked a group of ascending hikers if anyone was "KV_Streamer". They pointed to her and we shook hands and introduced ourselves. After a brief summary of the trail conditions to Tabletop, I wished them well and continued my descent. I arrived at the Phelps Mtn. junction at around 9:30 AM and realized I was likely to finish well within the allotted 6 hours. I started up the trail and paused at a flat icy section where I hid my snowshoes behind a fallen tree. Unlike Tabletop, Phelps' trail had far more exposed ice. Forty-five minutes later I stood on Phelps' sunny but crowded summit. Amongst the dozen or so hikers was "DLhiker" who I had the pleasure to meet for the first time. I spent about ten minutes on the summit, mostly soaking up the views. It was pleasantly warm in the sunshine and seemed like a good time to finally eat something. After downing a Clif Trail Mix bar, DLhiker asked it I could take a photo of his group. Operating the smartphone's touchscreen required me to remove my hand from my vapor-barrier glove. It led to a brief explanation of how dirt-cheap "food preparation gloves" keep my cold-sensitive hands warm and my mitts dry. I wished everyone a great hike and proceeded down the trail. The Trail Crampons did an admirable job and there was only one section where I had to proceed cautiously. Along the way I met several other hikers including "gb-mtns" and his wife who were registered for Phelps. Hi again folks! During my descent, I met two pairs of hikers who asked if they were close to the summit. By the terrain's appearance, I knew I was very close to the trail-junction. The entire ascent still lay ahead of them. I explained there was no way to sugar-coat it but they still had a significant climb ahead of them. I wished them well and proceeded to retrieve my hidden snowshoes. Upon arriving at the Phelps junction, the day's major ascents were done. All that remained was to return to the Loj. In the morning, it had taken me an hour, to get from the Loj to the Phelps junction, so I endeavoured to at least match that time. Unlike last week's "low energy" situation, mind and body were now in sync and I managed to shave 15 minutes off the hour. Total time was just under 5 hours but most importantly I felt better than at the end of last week's hike.